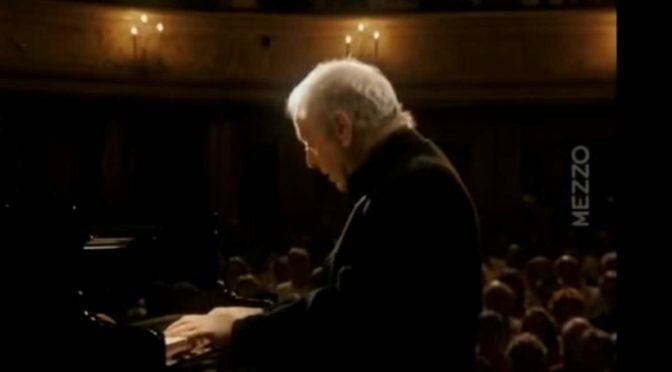 Daniel Barenboim performs Ludwig van Beethoven’s Piano Sonata No. 27 in E minor, Op. 90. Recorded live in Berlin in 2005. Beethoven composed the piece in the summer of 1814 (composer’s late Middle period) and dedicated it to Prince Moritz von Lichnowsky (1771–1837), a faithful friend and benefactor who was also the dedicatee of the famous Eroica Variations (The Variations and Fugue for Piano in E♭ major, Op. 35), a set of fifteen variations for solo piano composed by Beethoven in 1802. They are commonly referred to as the Eroica Variations because variations on the same theme were used as the finale of his Symphony No. 3 Eroica composed the following year. Although most of Beethoven’s piano sonatas are cast in three or four movements, this piece consists of just two movements. Both are provided with performance instructions in German. A few of Beethoven’s works of this period carried similar instructions in place of the traditional Italian tempo markings. Mit Lebhaftigkeit und durchaus mit Empfindung und Ausdruck (“With liveliness and with feeling and expression throughout”) The first movement, in E minor, is written in a 3/4 time. The restless character of the music has been noted by many commentators, including Donald Francis Tovey, who described the movement as one “full of passionate and lonely energy”, and Charles Rosen, who wrote of the “despairing and impassioned” mood. The movement is cast in sonata form in which the exposition is not repeated, and the development section is based almost entirely on the first subject. Nicht zu geschwind und sehr singbar vorgetragen (“Not too swiftly and conveyed in a singing manner”) The second movement is a gentle sonata-rondo movement in E major (the tonic major) and a 2/4 time signature. Its Romantic character, with foreshadows Schubert’s style in particular, has long been noted by numerous musicians and musicologists, e.g. American musicologist and pianist William Kinderman (born 1952), English musicologist, composer, organist, Beethoven scholar Barry Cooper (born 1949), and the American pianist and writer on music Charles Rosen (May 5, 1927 – December 9, 2012) – the latter considered the main melody to be “exquisitely beautiful” and an example of Beethoven’s most accomplished melodies.